The BIGGEST show on four-wheels revs into Durban, Cape Town and Johannesburg for the first time! Get ready for 8 four-meter tall, five-ton beasts including Max D, Gravy Digger, Megalodon and many more! Debuting at Moses Mabhida Stadium, Durban on Saturday, 20 April followed by Cape Town Stadium on Saturday, 27 April and FNB Stadium, Johannesburg on Saturday, 04 May. 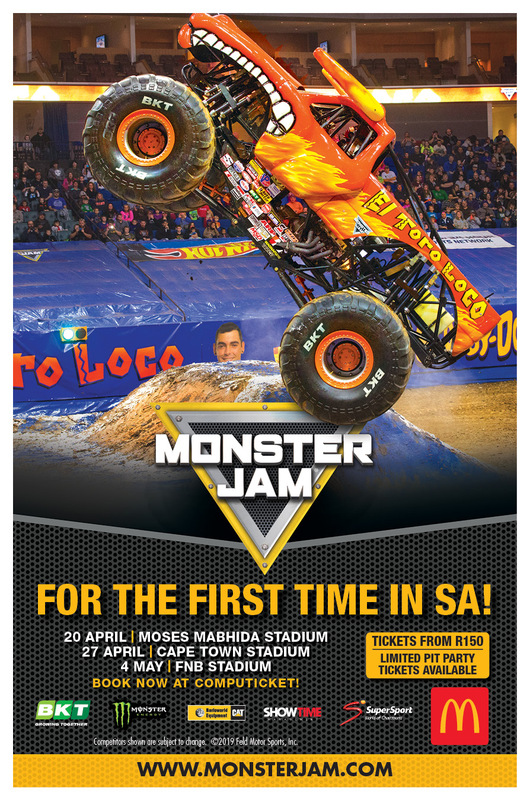 Limited tickets are still available, exclusively from Computicket, the official Monster Jam SA ticketing agent. Monster Jam is one of the most exciting forms of family entertainment, featuring four-meter tall, five-ton beasts. The stars of the show are the biggest performers on four wheels – the Monster Jam trucks. These amazing machines bring fans to their feet while racing and ripping up a custom-designed track full of obstacles to soar over – or smash through. World-class drivers compete in both Monster Jam truck racing and freestyle competitions in one of the only sports where male and female world-class drivers, some generational rivals, are equals competing for the same championship on the same track. Combining high-octane, spontaneous entertainment with the ultimate off-road motorsport competition, the jaw-dropping displays will leave families on the edge of their seats. With the best truck line-up ever assembled for an international performance, the show will feature six of the world’s most famous Monster Jam trucks, including Monster Jam World Finals ® champions Grave Digger ® and Max D TM , providing an unforgettable experience for the entire family. You wont forget the first time you see a Monster Jam truck defy gravity!. The larger than life spectacular takes place on specially-designed tracks that optimise mobility so the most recognisable trucks in the world can go head to head in wheelies, donuts, racing and freestyle competitions pushing the Monster Jam trucks to their limits. Standing four metres tall and four metres wide, the custom designed Monster Jam trucks weigh up to 4,500kg and are powered by super-charged engines delivering more than 1,500 horsepower. With tyres 1.7metre tall, a Monster Jam truck is capable of reaching speeds of up to 110kms per hour. Monster Jam trucks can jump as far as 43 metres in length. PLEASE NOTE: Fans are encouraged to only book through Computicket, the official authorised ticketing agent for Monster Jam. There are significant risks in buying from other sources and entry to a Monster Jam event is not guaranteed.